If you are ready for the warm summer weather, then it’s time to prepare your yard for the same. Now is the perfect time to add some special touches throughout your landscape, including eye-catching colors. Here in the Minneapolis area we tend to spend lots of time outdoors soaking up the sunshine after the long winter, so you want your yard to be a place you love to relax in as well as entertain. And being able to cut down on yard maintenance chores means you’ll have even more time to enjoy your landscape. 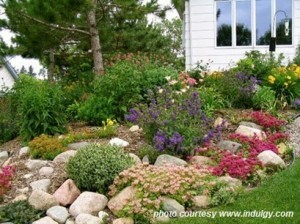 One way to do that is to convert some of your lawn space into a rock garden, or rockery. With the right design as well as appropriate plants, you are able to create a rockery that is sure to be pleasing to the eye. But before those rocks start going in, there are some decisions to be made. First, you have to consider where the rockery is going to go. The ideal place is going to be somewhere that there is free-draining soil. You also want a spot where there’s room for thoughtful placing of larger rocks and stones, so that means determining just how big you want your rockery. (They can cover an entire hillside or just one small corner of your yard.) Then the next step is choosing the spots for plants. You want plants to get a good hold when you put them in your rockery. They are then able to provide a pocket of color and/or texture. You need to make sure that you choose the right plants for the job as well. In addition to the proper plans, the right mixture of plants within your rockery is important as well. In addition to plants, there are also shrubs and trees that you can make it stand out. As you’re choosing plants, pay attention to the sun needs as well as the amount of sun your chosen rockery spot will get. Here are just a few suggestions for rockery plants based on sun requirements. Aubrieta is a plant that produces beautiful large white and purple flowers to provide the color that you are after. Aubrieta also forms clumps of grassy green foliage that mixes in well with the colors. Dickson’s Gold Bellflower is a low-growing flower that provides a golden foliage and purple-blue like flowers. It is the best for moderate sunlight areas. Lithodora produces true blue flowers and with the evergreen foliage; they can produce some of the best color mixtures. Dwarf Hinoki Cypress is a compact evergreen plant. Some of them come in golden while others have different colors throughout the year. Leather Polypody is a fern that is sturdy and strong. The lush foliage is able to spread and fill in any nooks left behind after planting. London Pride Saxifrage has thick green leaves that have golden spots on them. The thin stalks hold delicate white flowers during spring time. Of course, there are many, many other trees, shrubs, and flowering or foliage plants that will work well in a rockery garden. If you are considering adding a rockery, to your yard but do not know where to start, speak with us at Architectural Landscape Design. We can talk over your ideas, evaluate your current landscape plan, and make suggestions of how to get you well on your way to having a beautiful rockery. We are a Minneapolis MN area landscape design and installation contractor, and rockeries are just one of the many low-maintenance landscape solutions we’ve got. 952. 292.7717.